To celebrate Breath of Fire: Dragon Quarter's 14th anniversary in North America I decided to gather 14 facts which are not well known by fans. 1. During the time Breath of Fire V was in development Capcom wasn't doing well financially. 2. In general JRPG weren't selling well, and a huge wave of games were slowly turning away from turn based RPGs (unlike the wave to bring it back, as seen from the huge success of undertale). The creators decided to make game, which was not a Breath of Fire game. 3. You may find a lot of small links to "Breath of Fire 2" in "Breath of Fire V". The most noticeable one is the faction of "Rangers". 4. Bosch was suppose to be a dog, or more to say a member of the Grassrunner Clan (As seen from the official artbook), and by so- being a link to Bosch Doggy, better known as "Bow" from Breath of Fire 2, and who was also a ranger, and Ryu's best friend. At the end, Bosch took the typical blond black dragon look (like Ray from Breath of fire 2, or Jade from breath of fire 1, or Klaus from breath of fire 6). 5. Lin was suppose to be Deis (as seen from the artbook), and by so having Deis appear in every breath of fire game. But at the end it didn't happen, and Deis is missing from this title (she is back in BoF 6 though). 6. Lin is probably supposed to look like Katt (Also known as Linpoo Chuan) from Breath of Fire 2. Therefore, having 3 returning chars from breath of fire 2, which will be Nina, Bow and Katt in theme. 7. There is a lot of similarities between Nina of Breath of Fire 2 and Nina from Breath of fire 5. Although the latest is not a princess, but they both have dark magic abilities, both have strange wings, and both heralding a great disaster/ change in the coming event. Also people want to kill them both for the safety of the future. 8. Breath of fire V is the first game where Nina is the silent member and Ryu is the outspoken one, having their rules reverse (a clear parody to how it been in Breath of Fire 3 and 4). Also this is the first game where Ryu is older than Nina. (True, in breath of fire 1, Nina starts younger but because of plot process she is becoming older). 9. Despite what many thinks, Breath of Fire V did sell well. Breath of Fire: Dragon Quarter was the top-selling game in Japan during the week of its release in November 2002 at 80,059 copies and it continue to have surprising good feedbacks despite the change it took from the rest of the series. 10. Elyon was based on Fou-Lu's appearance. 12. In Breath of fire 2 it is Ryu that gains the ultimate power from a dark dragon (Ray) by facing him. In breath of fire 5 it's the other way around, where Bosch is getting his power by facing Ryu. 13. Elyon name is driven from the hebrew words "El Elion"- which means supreme god. These are awesome facts, some were a surprise even to me! - The North American and European versions of the game differ a little in the mechanics of saving the game. Whereas the NA version features small amounts of Save Token drops, there is a temporary save function that lets you pick up where you left off while erasing the temp save. The European version doesn't have this temp save function, but as a caveat, Save Token drops are plentiful. I'm glad that a few points were addressed regarding the thematic parlalles to the series and the directors decision to contrast basic Breath Of Fire expectations. All the piers are there, but undeniably portrayed in a different light think Aliens to Alien or Dark Souls 2 to Dark Souls. The thematic parallel I appreciated the most was the depiction of a brood which blocks the entrance to the outside air. In contrast, BOFII had Ryus mother sacrificing herself to seal the cave and hold back an evil force, while in BOFIII the prologue depicts childhood Ryu being unearthed from the mines which was guarded by his dragon form mother. The dragons are portrayed as nurturing, motherly and protectors of the species, showcasing an intention to preserve th race. BOF:DQ interacts with this scenario very differently! Does it imply that our actions as humans is a path to demise the brood race? Fun stuff to ponder over a beer or two. The last point which should be added, but obvious to anyone who's played the title, using D-Form (although fun!) handicaps the player and provides a disabling element to the story board of DQ. This is a direct contrast to every other entry into the serious. There was supposed to be fishing mini game but it got cut out. A lot of facts that were from the artbook are listed in the wikipedia article under development. They were inspired to create the world based off of a novel called The World Five Minutes From Now. These may have actually came from what Mary translated out of the artbook before all of that information disappeared because it seems just like what she had translated and written up. and an actual photo of my gameplay when DQ came out. Long before we had better ways of doing this... Nina bombs are the best. Also, I love buki. Best wand ever. Huh. Evidently Hideki Kamiya worked on BoF2. I did not know until recently. MrBaba wrote: Huh. Evidently Hideki Kamiya worked on BoF2. I did not know until recently. That's an interesting trivia, if there even was one. 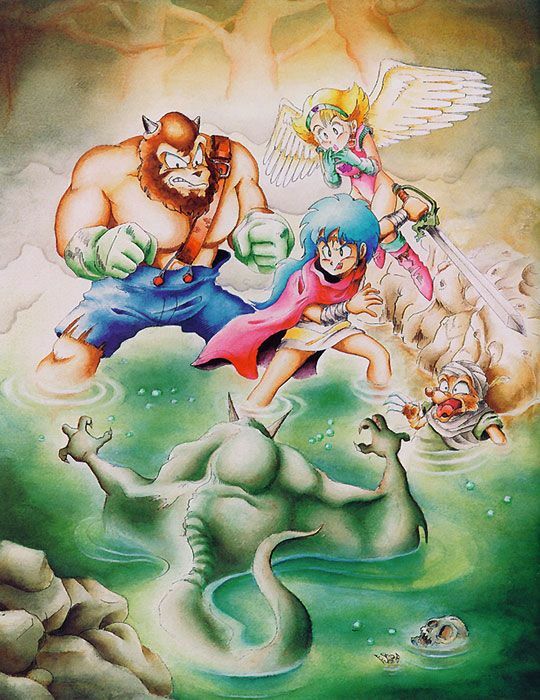 Speaking of famous people, Keiji Inafune was an artist for Breath of Fire I. I don't know if he just did one art piece, but I think everyone knows which one. Really interesting information, thanks for sharing. I was actually just watching a speed run of Dragon Quarter where they pointed out the role reversal between Nina and Ryu in terms of the whole silent protagonist thing. I enjoyed Breath of Fire V a lot, especially its plot, which I think is very underrated in the series in terms of its depth. I think it continues a lot of the interesting religious and particularly Gnostic themes of the series as a whole. Haha funny thing is during my first play through ever, I SOL'd like 20 times before finally reaching Jezuit. He didn't take very long to kill Ryu and Lin, so I was literally having Nina run away from him and set mirage bombs for what felt like an hour. That's the first time I killed Jezuit lol... But then i was boned on my supplies so when I got to the next regent alls I had was a depleted Nina. Ryu and Lin obviously got partially revived after the battle, but I had no way of healing them. Needless to say I lost to the next Regent. Still fun times and memories with Mirage bombs lol.